The lower leaf surface and flowers of a very richly-colored form of Columnea cruenta growing as a large terrestrial (or fallen from heaven?) in lowland tropical rainforest, Guna Yala, Panamá. This species can be confusingly similar-looking to the ocasionally sympatric C. perpulchra in parts of its range. Columnea cf. schimpffii, a beautiful Ecuadoran species in cultivation in Guatemala. Columnea is the largest genus of Neotropical Gesneriaceae with somewhere around 250 accepted species. Like many other taxonomically-diverse plant genera in the American tropics, recent fieldwork has shown that it is apparently under-described. This genus will almost certainly end up registering a substantially higher number of recognized species when regional floral inventories are completed in the future. Columnea is also a very wide-ranging genus occurring from northwestern México to central Bolivia as well as parts of the Caribbean and northeastern Brazil. Notable centers of endemism are located in the uplands of Costa Rica-western Panamá, southwestern Colombia-northeastern Ecuador and the southeastern Ecuador-Peru border region. Colombia is, unsurprisingly, the most species-diverse country for columneas with almost 100 accepted species and more on the way. A number of these are shared with neighboring Ecuador and Panamá. Almost all of the more familiar “flying goldfish” species in cultivation originate from Mesoamerica, especially Costa Rica, which also provided the genetics for many popular hybrids. Columnea consanguinea viewed from above and growing as a terrestrial in cloud forest understory, Panamá Province, Panamá. The majority of the more attractive and dramatic-looking columneas have so far missed gaining a wider audience due to their large wingspans when fully mature. The combination of elongate leaves and gaudy contrast colors against vivid green backgrounds is strongly reminiscent of the plumage on Amazon parrots and led me to christening them “parrot feather” columneas when I first began growing them about 15 years back. While perfectly suited for hanging pot and vertical garden culture, some can occupy a lot of airspace after a couple years thriving in their growing areas. Nonetheless, quite a few of them are most definitely worth having around because of their stunning combinations of flower color and the ornamental markings on the undersides of their leaves. As specialty nurseries in the U.S. and the northern Andean countries increase their offerings of unusual and/or rare tropical plants, there is a wider variety of columnea species available to collectors than at any time previously. Leaf detail of flowering Columnea orientandina in cutivation in Guatemala. This is the most commonly cultivated species in this group, and is fairly common at intermediate elevations in southwestern Colombia and Ecuador. Formerly a pentadenia, it also displays the combination of conspicuous leaves and discreet flowers discussed here. Most of the species shown here were formerly segregated in the genera Dalbergaria or Pentadenia. All of them have similar plant architecture, with spreading stems and long, broad and often “fuzzy” or lightly pilose stems and leaves. Some of the former dalbergarias also show slight to extremely asymmetrically-sized leaf pairs, particularly when young. From an ornamental plant collector’s perspective, their biggest attraction are the often very attractive colors displayed the undersides of their relatively large leaves; many also have showy flower bracts and corollas as well. Unless very small, they are best displayed as hanging subjects under airy, bright shaded conditions. Vivid red or violet “flash” blotches, leaf-tipping, mottling or striping are very effective ways for this group of plants to draw the attention of their principal pollinators, hummingbirds, and to guide them to (usually) less conspicuous flowers located in the leaf axils well inside the foliage. It is worth noting that many of the most striking members in this group have cream-colored or yellow corollas, rather than the bright orange or red that one usually associates with bird-pollinated flowers in the region. Seen from above or at eye level in cultivation, these very effective visual lures are usually invisible. The leaves have quite a different appearance than when they are suspended high in the canopy and observed from below. Their arching stems and spreading growth habit facilitates access to the tubular corollas by hummingbirds. Columnea zebrina viewed from below, growing in high canopy, lowland tropical rainforest, Comarca de Guna Yala, Panamá. A few of species included here have been grown as curiosities or “one-offs” in many botanical gardens and private collections for some time, especially a few wide-ranging southern Central American and northwestern Andean species such as Columnea cruenta and C. orientandina. The former is a variably-marked species from individual to individual at a number of localities where I have encountered it in Panamá. Some well-known U.S. botanical gardens such as the Smithsonian, Marie Selby, the Huntington and several large university collections have very diverse research collections of Neotropical gesneriads, including wild-accessioned examples of this type of columnea. 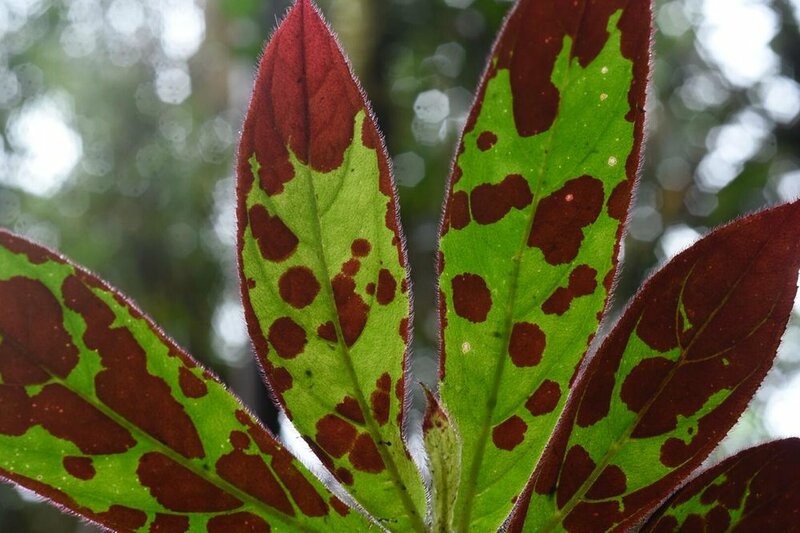 Columnea zebranella is endemic to the summit region of Cerro Jefe, Panamá Province, Panamá at over 3,000’/925 m. It is somewhat variable in leaf color, with some examples being much more intensely-colored than this plant. Rare and very localized in nature, but in limited cultivation in the U.S. and Guatemala. This species is sometimes confused with C. hirsutissima and other superficially similar species that occur on Cerro Jefe. While most of these plants can be grown to maturity and a plant span of ~30”/75 cm in an 8”/20 cm hanging pot, a few can become massive (>6’/1.85 m) in diameter over time and will require 12-14”/30-35 cm hanging baskets or a humid vertical garden setting in order to properly retain their foliage and a natural aspect. For most growers, the simplest solution to keeping the giant species in check it to periodically chop the plants and re-start them in 6-8”/15-20 cm pots. Pure, loosely-packed sphagnum moss is an excellent growing medium for most of the species shown here, but they are also happy in fine bark and perlite/pumice mixes bound together with a handful of sphagnum peat. Smaller plants can be liquid fed every fortnight during the growing season with balanced orchid fertilizers, while larger established plants can be fertilized with any of a number of prilled, time release products on the market. 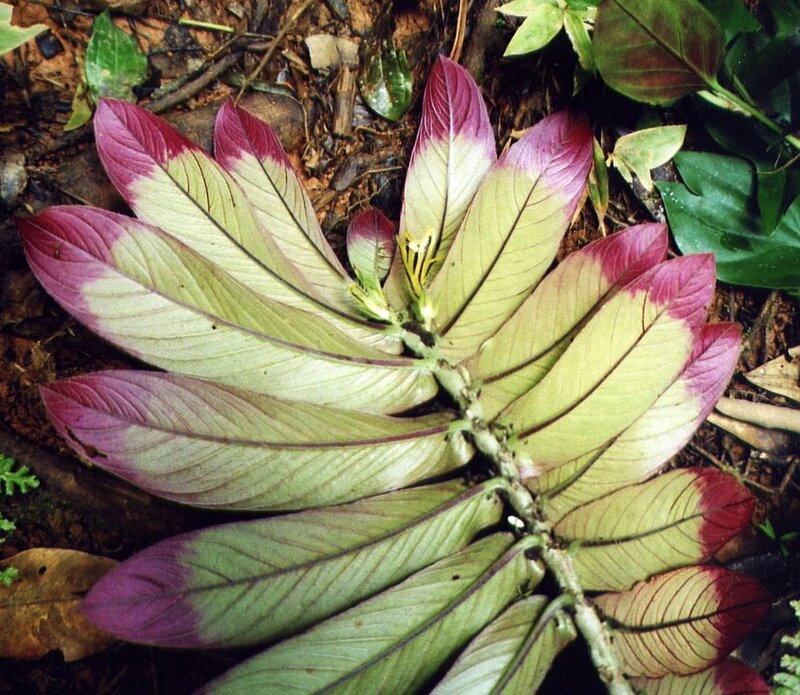 The vividly-colored central Panamanian endemic, Columnea zebrina. This is a fairly large, lowland species usually found at elevations under 1,600’/500 m, growing together with C. cruenta and C. consanguinea. Above left, wild stem on forest floor; right, a cultivated plant in a greenhouse in Guatemala. A number of Panamanian columneas have red, violet or black-striped corollas, including a few unrelated species. Their principal pests in cultivation appear to be aphids, thrips and mealybugs during the warmest months. All are readily controlled with spot sprays of contact or systemic pesticides. Spider mites (several genera) can also be a problem under hot, dry conditions, but can be suppressed by rotating sprays of any three combinations of effective miticides on five to seven-day intervals. In recent years, gesneriad collectors have become understandably concerned about the spread of Impatiens Necrotic (Ring) Spot Virus (INSV) in their collections. Columneas are known to be susceptible to INSV and new introductions of any potential host plant should be inspected carefully and (preferably) quarantined before adding to valuable established gesneriad collections. Both poor practices (such as not disinfecting cutting tools between plants) and insect vectors (mainly greenhouse thrips) can spread this virus throughout a plant collection in short order. Any plant suspected of having INSV should be isolated for observation and then destroyed if any of the diagnostic signs manifest themselves unambiguously on the plant’s foliage (ring spots, unexplained persistent chlorosis or necrotic tissue, etc.) or the plant tests positive with Agdia Immunostrip or equivalent kit for screening for this virus. Columnea cf. inaequilatera in cultivation in Guatemala. Dalbergarias with red flowers tend to have unremarkable or lightly-marked leaves. Due to space and availability constraints, currently I only grow a handful of parrot feather columneas in California, including a pair of clones of Columnea medicinalis from Ecuador, C. consanguinea, C. zebranella and a NOID red C. species, all from elfin forest in central Panamá. In Guatemala I grew several other species, most notably C. zebrina, C. perpulchra and a few color variants of C. cruenta from the Panamanian lowlands. Other noteworthy species worth keeping an eye out for include C. cuspidata, C. ericae, C. picta, C. tessmannii and C. vilossisima. No doubt many new and showy species will also make their way to market over the next few years. They are all beautiful subjects when well-grown, are easy to cultivate and propagate, are generally moderately temperature tolerant and make nice companion plants for other Neotropical ornamentals. A well-grown specimen of any of these species is a traffic-stopper in the greenhouse or garden and is worth making space for. Columnea perpulchra from El Copé, Coclé Province, Panamá in cultivation, Guatemala. Columnea cruenta from Coclé Province, Panamá in cultivation in Guatemala. This species is relatively common in a variety of ecosystems from northwest Costa Rica to southwest Colombia. It is one of the few species in this group that lends itself to cultivation as a terrestrial, trained more or less upright in a large pot. The plants can exceed 4’/1.20 m in height when grown like this. This photo shows how inconspicuous the flowers are in this species when compared with the red windows at the leaf tips and the scarlet floral bracts. Two forms of Columnea cruenta from central Panamá. Left, a cultivated plant from the Caribbean lowlands in cultivation in Guatemala. Right, leaves on a wild plant in cloud forest (Image: F. Muller). Note the red floral guides on the tips of the corollas in the cultivated plant. This species is widely distributed throughout the country from sea level to 3,250’/1,000 m.
Columnea cruenta growing as an epiphyte in under canopy, lowland tropical rainforest, Comarca de Guna Yala, Panamá. Notice how conspicuous the flash marks on the undersides of this species are, even in low light environments. Fruiting Columnea orientandina and C. cf. medicinalis (above right) viewed from below in greenhouse cultivation in Guatemala.